As the oldest Baby Boomers reach retirement age and older generations live longer, more counties across America are graying. 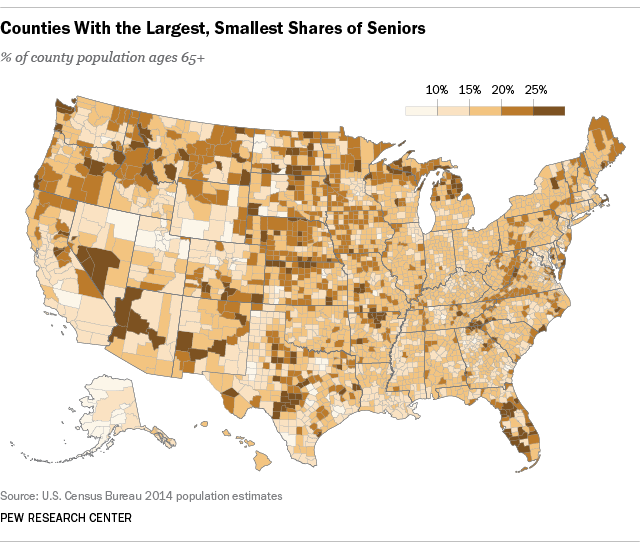 A new Pew Research Center analysis of the Census Bureau’s 2014 population estimates finds that 97% of counties saw an increase in their 65-and-older population since 2010. And some counties are “aging” much more rapidly than others. Several counties in Colorado are among them. Douglas County, Colo., just south of Denver, led the nation with a 53.7% increase in the 65-and-older group from 2010 to 2014. Two other Colorado counties, Routt, on the Wyoming border, and Elbert, southeast of Denver, rounded out the top three, with growth rates above 50%. By many measures, Florida – which has long attracted snowbirds and retirees – is one of the nation’s grayest states. Overall, 19.1% of the Sunshine State’s population is 65 and older, the highest percentage in the nation. 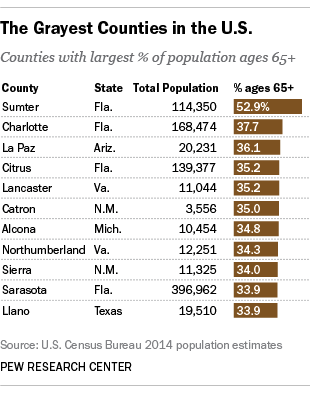 Sumter County, west of Orlando, is the only U.S. county where more than half (52.9%) of residents are 65 and older. Sumter County also has the highest median age in America: At 65.9, it beats the county or county equivalent with the lowest median age (Lexington city, Va.) by nearly 44 years. Ranking second in percentage of people who are 65 and older is Charlotte County, Fla., with 37.7%, followed by La Paz County in Arizona (36.1%) and Citrus County in Florida (35.2%). In Florida, 53 of 67 counties have an above-average share of people 65 and older when compared with the percentage of Americans in that demographic (14.5%, or 46.2 million). Not all U.S. counties are aging – in fact, a tiny share of counties (3%) saw a drop in the 65-and-older demographic since 2010. Oklahoma’s small Alfalfa County, on the Kansas border, had the highest rate of decrease in the 65-and-older population, at 9.5%. North Dakota – a state that we’ve noted for the recent surge in its male population – had two counties, Williams and Wells, rank among the top five for rate of decrease of adults 65 and older. Three counties experienced no change since 2010. Alaska is the “youngest” state based on its share that is 65 and older (9.4%). Fully 26 of 29 Alaska counties have percentages of people 65 and older that fall below the U.S. average.